The arrival of warm weather means that you’re likely going to be spending more time outdoors, which also means your chances of getting bitten by bugs vastly increases. While it’s impossible to prevent every bug bite, there are a variety of ways you can ward off the majority of them. When bites are unavoidable, you’ll need an effective way to take away the pain and itch quickly. Check out these 21 blog articles to find solutions for bug bite prevention and treatment for both you and your favorite four-legged friend. Bugs are attracted to tight, dark clothing and strong fragrances, so it’s important to wear loose, light colored clothing and minimal perfume or deodorant. Mosquitoes, which are prevalent in the warmer weather, thrive on standing water, so make sure that you rid your yard of any standing water. You’ll also need some type of topical treatment to deter any bugs that aren’t put off by these preventative measures, and the following seven blog posts are full of different treatment ideas. Preventing Insect Bites According to this blog post, insects don’t like vitamin B1 or thiamin. By taking this vitamin regularly you will emit a fragrance that keeps bugs away. 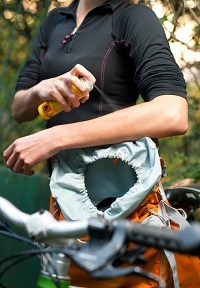 Avoiding Mosquito Bites and the West Nile Virus Try to avoid being out at dawn or dusk when mosquitos are most likely to bite and be sure to wear bug repellent containing DEET. Mosquito Prevention and Treatment, Updated Make sure to empty any standing water and wear light colored loose clothing if you have to be out at night to help repel mosquitos. Lemon Oil Prevents Mosquito Bites Without Irritating Sensitive Skin Lemon oil and citronella oil can be used undiluted on the skin to deter bugs. Catnip and clove oils should be diluted before applying, but are also effective bug repellents. How to Avoid Mosquito & Insect Bites During Your Gap Year If you are trying to avoid DEET, you can use DEET-free sprays that contain Picaridin instead. Preventing Bug Bites When Camping When camping, avoid doing so near bodies of water and make sure to build a campfire – the smoke from the fire will repel the bugs. How to Avoid Bug Bites: Jungle Secrets for Mosquito Control Wash with Irish Spring soap and apply cinnamon oil mixed with witch hazel to your pulse points to avoid bug bites. Typically, bug bites aren’t life threatening unless you are highly allergic, but that doesn’t make them any less of an irritating nuisance. Sometimes you can find some relief simply by applying some ice to the bite. There are many ways to treat the pain and itch of a bite, and you can find several methods for doing so in these seven blog entries. 7 Ways to Treat Bug Bites (Slideshow) Dab lavender oil onto the bite a few times a day and the bite should go away quickly, according to this post. Relax!! It’s Summer!! Tip for Treating Insect Bite or Sting Learn how to remove the stinger if you or your child is stung and how to treat the site of the sting. Fast and Effective Mosquito Bite Remedy (That’s Probably Already in Your Kitchen) Rub the inside of a banana peel on a mosquito bite to not only stop the itching, but also help it heal faster. Homeopathic Bug Bite Bustin’ Learn about several homeopathic remedies you can use on mosquito bites and bee stings. Natural Health Remedies for Insect Bites and Stings Crush an aspirin, make it into a paste with water and apply it to the site of the sting for some pain relief. Natural Remedies for Insect Bites and Stings This post is full of helpful tips, such as how the cut side of an onion will stop the itching of bug bites and vinegar on a cotton ball will stop the pain and itch from a spider bite when applied. Annie’s Surefire Mosquito Bite Remedy Apply ammonia to a cotton ball and dab it on your mosquito bites and it will take the pain and itching away within a few minutes. Unfortunately, pets are not immune to bug bites and stings and they can have allergic reactions just like humans can. What pets can’t do is prevent these bites or treat them after they happen to prevent infection, which is where the owners come in. There are pet-friendly topical sprays that are safe to use on your pet to keep bugs away. If your pet has already been bitten, use these seven blog posts to find treatments and remedies that will provide them with some relief. Homeopathic Treatment and Prevention for Bug Bites Improve your pet’s immune system and he will be less likely to get certain bugs like fleas. Protect Your Pets from Fly Bites Treat your pet with preventative methods for insects as you would for yourself, however avoid spraying an insect spray around the face and ears. Protect Your Pet from Mosquitos Keep your pet inside during prime insect time and use a topical insect repellent on him. Pets and Insect Bite Reactions If your dog has a swollen muzzle due to an insect sting you can give him antihistamines, but you will need to work with your vet to find out the dosage. Essential Survival TV—Essential Oils for Insect Bites & Stings Watch this video to learn ways to use essential oils for your pet and how to make your own flea collar. Using Benadryl to Treat Dogs for Allergies, Bites and More Learn when and how you can use Benadryl to treat allergies and allergic reactions to bug bites. 3 Summertime Dog Bug Bite Remedies Find out how to deal with a tic attached to your pet and how you should remove it properly.